A stone cold classic returns to the Irish Film Institute this week in the form of Night of the Hunter. This 1955 movie features a career defining performance from Robert Mitchum as a zealous preacher who marries a naïve widow in order to learn the location of the money her husband hid before his death. 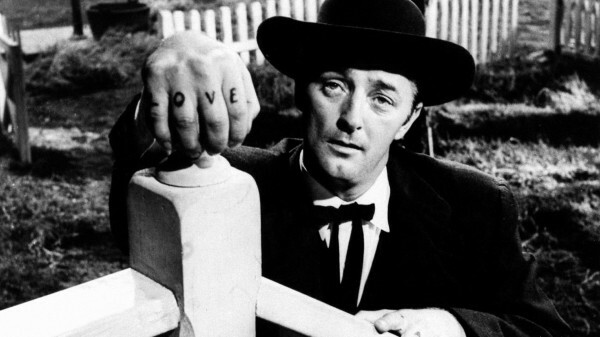 Mitchum’s “love/hate” knuckle tattoos and preacher’s outfit make for one of cinema’s most enduring images. The film was directed by British actor Charles Laughton who does a stellar job creating a memorable tapestry of images. Sadly, Laughton never directed again as the film was a flop with critics and audiences on its release. Time has been more generous, however, and Night of the Hunter is now regarded as one of the best films of its era. The week’s big new release is The Wolf of Wall Street, the fifth collaboration between director Martin Scorsese and actor Leonardo DiCaprio. It tells the true story of Jordan Belfort, a former Wall Street broker who conned millions from naïve clients through selling worthless shares. The film was rushed into cinemas quickly in order to qualify for the 2014 Oscars, leaving Scorsese little time to work on its editing. And it shows. At three hours, the film is something of a mess. I’m not sure if the movie would benefit more from being an hour longer or an hour shorter, as there are subplots and characters that feel either unnecessary or under developed. That said, it’s an entertaining romp featuring a standout performance from DiCaprio in a role he seems born to play. Two years ago, the low budget horror The Devil Inside, released in January, was a surprise hit and as a result January has replaced October as the month for horror releases. This week sees the latest Paranormal Activity cash-in, Devil’s Due, hit our screens. Essentially a first-person take on the horror classic Rosemary’s Baby, it’s a derivative and largely dull affair. No doubt it will rake in the cash though.